A book by left-wing US author Noam Chomsky has reached a bestsellers' list after Venezuelan leader Hugo Chavez praised it at the UN last week. 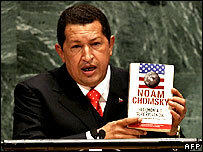 A speech by Mr Chavez cited Chomsky's 2003 critique of US policy, Hegemony or Survival: America's Quest for Global Dominance, as an "excellent book". Mr Chavez also said US President George W Bush was the "devil" who had left the UN podium smelling of "sulphur". Chomsky's book spent the weekend at the top of Amazon.com's bestseller list. The 77-year-old linguistics professor told the New York Times newspaper last week that he would be "happy to meet" Mr Chavez. He said he is "quite interested" in Mr Chavez's policies and regards many of his views as "quite constructive". Mr Chavez urged his audience at the UN General Assembly to read Chomsky's book, saying it would help explain "what has been happening in the world throughout the 20th Century... and the greatest threat looming over our planet". Holding up a Spanish-language edition of the book, Mr Chavez said "the hegemonic pretensions of the American empire are placing at risk the very survival of the human species".